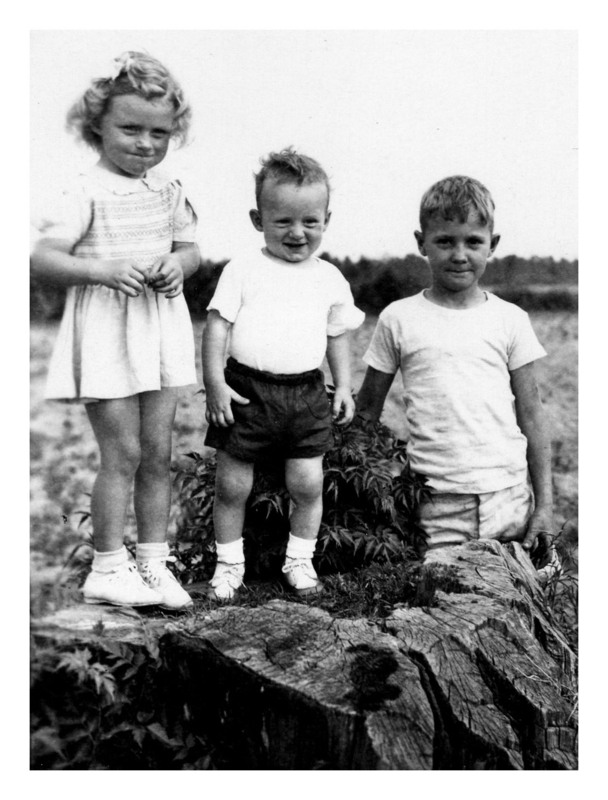 Betty and Harold Motte with their Uncle Mike Powers at Mimi and Da’s, late 1940’s. Even though I live in a condo I’ve been watching a lot of Home and Garden TV lately, admiring the way talented landscapers transform an ordinary lawn into a sunken garden complete with waterfall. I’m with them – no more mowing! But then my thoughts and memories began to wander back a few decades, to my childhood days of playing outside in the yard. We didn’t have “lawns” in those days. Everybody had a front yard and a back yard, maybe a side yard too. Gardens were where you planted tomatoes and butter beans and some city yards had a little garden too, way at the back of their regular yard. To a city kid raised in the middle of town, ordinary grass was what everybody had in their yard, unexciting, turned-brown-in-the-summer, plain grass. There might be a little square of bare dirt in an unpaved driveway or neighborhood park, but it was usually a puny little patch. But on those summer occasions when my brother and I got to spend time at Mimi’s house, we had great expanses of exciting, inviting dirt. She did have some flower beds near the house which were strictly off-limits, but she also had something us city-dwellers didn’t have – a huge side yard and back yard full of mostly weed-free dirt. The color of dirt can be quite varied here in the Pee Dee, ranging from blackish-brown just right to plant vegetables, to gooey yellow clay that seldom washed completely out of your clothes, to whitish-tan sandy stuff. Mimi’s dirt was medium brown, not gooey at all but sort of sandy. Mimi’s dirt was just right for us little kids with long summer days to fill with exploration, excavation and other assorted outdoor fun. It didn’t make sticky tracks in the house, which was a good thing, considering that a favorite pastime was running in and out of the house with a brief pause in the kitchen for a drink of cool water. There’s just something about the smell of dirt right before, during and after a summer rain shower. If it only sprinkled and didn’t pour, you got the full flavor of it. It drew you right outside to splash or stomp, if you could find the right size puddle. You could make neat mud pies to serve to your companions – usually a kitten or an old doll baby in my case. Or if the dirt was just damp and not soppy wet, you could draw major house plans which would stay put on the ground for a while. Dry dirt was better for playing marbles, of course. The texture of dirt was also interesting. Once the weather warmed up we went barefooted most of the time. That first feel of hot summer dirt on my bare feet was so luscious, so luxuriating, the grit between my toes was hardly noticeable. If we had to put on sandals for a ride to the store, we seldom washed our feet first. Why wash? They were just going to get dirty again soon. Sandals off, back to bare feet ASAP, that was our motto. In examining the possibilities of dirt, we discovered that sandy dirt doesn’t stick together too well unless it’s just the right consistency and dampness. Even then, when it dries out it tends to fall apart. You needed to mix in a bit of granddaddy’s dirt to make good building material, such as for walls around a mud puddle to keep beetles or small turtles in, or to deepen the puddle for floating twig-boats and popsicle-stick barges. Da’s field dirt was darker brown than Mimi’s yard dirt. A cross between sandy and loamy, the dirt in the plowed fields beyond the house was where granddaddy planted watermelons, or tobacco, or cotton. After his tractor made neat straight rows but before the seeds went in, that dirt was perfect for investigating and excavating. We loved digging there for arrowheads. We found quite a few over those summers but for some strange reason Mimi and Da didn’t want us to make real arrows with them, just save them for “show and tell” at school later on. When not on one of our archeological digs, Da’s field was excellent for seeing how deep we could bury our feet, or shoveling up a bucket full for later use. I haven’t gone barefooted in years but I believe my feet retain the memory! The closer summer gets, the more my toes seem to yearn for Mimi’s warm yards and Da’s fresh-plowed fields. I really have fond memories of most things about dirt, except the tin tub baths that Mimi insisted we take at night to remove it from our persons. 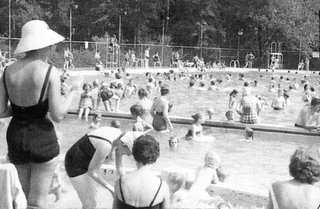 Timrod Park Swimming Pool, 1950’s… the scent of chloride, “thunk thunk” of the diving board and splashes of fun-loving swimmers. Summers were pretty safe for kids in search of fun in the late 1940’s and early 50’s Florence. After school and on Saturday afternoons, pals could inhabit city streets without parents going nuts with worry. You could leave your unlocked house, ride your bike or roller skate along city streets, come home for a quick parent check, then go again. Round up a few friends and you could play a game of hopscotch drawn on the sidewalks with bits of rock, play tag, pick-up-sticks, marbles or jacks. If a neighbor had recently acquired a new wringer-washer, you could use the left-over packing crate for a handy jeep. A real find might be a sturdy refrigerator box — handy for two-man tanks. Gather up a few more kids and war games, cops and robbers or good old cowboys and Indians might occupy the territory from McQueen Street to Warley. Some afternoons when usual buddies were occupied with other stuff, I liked to wander around town and eventually end up at the Library or Timrod Park. The interior of the block between McLeod Hospital and downtown made for interesting exploration. The hospital laundry with its open doorways, rising clouds of steam and swoosh, swoosh of the iron presses was an attraction. Several straggly trees and bushes divided the interior of the block into parking sections, and narrow alleyways lead to Evans Street, Irby, Cheves or South Dargan. The back doors to Barringer Hardware or Waters Furniture Store accumulated piles of discarded pasteboard boxes and packing crates. Here was a great source of components for our make-shift jeeps, tanks and body armor. I made a mental note. Nowadays the tarry smell of Pinesol triggers a mini-vision. One day as I was studiously avoiding the mud puddles between Dr. Stokes’ office building and McLeod on my shortcut to Kresses, an odd odor wafted by my nose. Looking toward the rear of stores along West Evans, I spotted workmen up on a flat-top roof, spreading out thick black tar. I slowed my pace to watch a bit, then took a wide detour around the roaring tar kettle surrounded by globs of cooling goo. The Library was another destination of choice on summer afternoons. When it was too hot to continue outdoor games, the cool stacks encouraged “well-mannered” kids to browse and stay awhile. Over several years I graduated from the basement Children’s Department and the Bobbsey Twins mysteries up to the main floor and Sherlock Holmes, reading chapters at a time before I ever made it to the check-out counter. I admire our new Library, of course, but there was an atmosphere of world-wide adventure in those old stacks that drew me back week after summer week. I’d leave with my limit, arms full of mystery and mayhem, one book propped open to read as I made my way home, one eye on the page and the other on my feet. After my family’s move to Mohawk Drive, my path home lead through Timrod Park. Of course, reading about England, Timrod became London’s St. James Park, and Sherlock Holmes inspired a less than straight line of travel. I’d enter at the Coit Street edge, avoid the swing sets, sliding boards and Timrod School, then skirt the swimming pool with its scent of chloride, “thunk thunk” of the diving board and splashes of fun-loving swimmers. As I meandered, I was peopling the park with 1890’s ladies and gentlemen, with perhaps a detective or two from Scotland Yard thrown in for good measure. The lifeguard’s whistle might be a London Bobby calling for reinforcements as he chased the bad guys through a cobbled street. Continuing on, I would usually cut by the amphitheater and picnic tables and wind up my westward route at the rose garden. “London” bridge would take me across the “Thames” to weave my way in and out of shaggy oleander bushes, struggling to maintain my hold on all those books while climbing the steep path to Waters Avenue. I was only a block out from home. Arrival home might mean present tense pots and pans to wash or potatoes to peel for supper, but by then I didn’t mind — another shortcut through the innards of a city block, another adventure at the Library or meander through Timrod Park was always coming up. 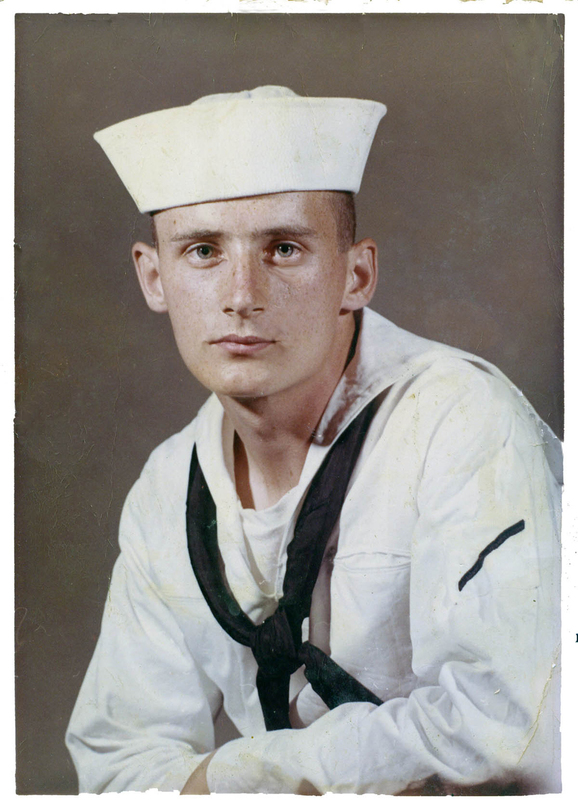 During the hostilities leading to the Six Day War in 1967, I was a Navy radioman on the ammunition ship Mazama in the Mediterranean Sea. When our ship hit port in Turkey, I got word that my mother was very sick and I had to come home. The Turkish Air Force got me from the ship to the dock and took me to the end of a commercial air base where I boarded a military plane. I flew from there to the big naval base at Rota, Spain, where you took off to come to Virginia or New Jersey. So I’m just sitting there waiting on my flight and about 3:00 that afternoon, a Navy petty officer comes and wants to know if anybody there has any kind of secret clearance. He said they needed a guard to go with the courier, an Air Force colonel, on a C130 that was leaving in 30 minutes and would arrive about midnight in Norfolk, Virginia. I’m thinking, okay, I’ve got clearance. I’m not supposed to take the jet out of here until about midnight and we’d get to New Jersey about 3:00 or so in the morning. But if I go on the C130 now as a courier guard, I’ll land in Norfolk about 12:00 o’clock and I’ll be a lot closer to home. Makes sense, right? So I agreed to go. He took me over to a hangar where there’s this pallet about 15 feet square piled with canvas bags, all classified material going to the States. Then he hands me a 32 revolver in a shoulder holster and four bullets taped up in masking tape, in a little row like you buy screws. I felt like Barney Fife on the Andy Griffith show and I’m thinking, what good would that do me — “Just a minute, let me get these bullets out of this tape and load up my gun before you do anything”?! Then a fork lift hoisted that pallet and me, my 32 revolver and my taped-up bullets up into the back of this giant C130 cargo plane. The colonel is already there, and all there was in the back of that huge plane was me, the colonel, two little cots, this pallet of stuff, the Cargo Master, and the pilots. So we went up with the pilots, they descended to 2000 feet, opened up the back end of the plane and re-shut it, re-pressurized it, and we went on back to our cots. See, we’re on a plane with all this classified material and if something was to happen, such as somebody tries to get that material, then the white phosphorus would be ignited. And if the plane crashed, it would ignite. If you even breathe on it very closely and you have hot breath, you’re liable to disappear! White phosphorus is highly volatile at a very low flash point, and it would literally disintegrate that whole plane and us and everything around it. He said a write-up was something wrong with the plane that needed fixing, and we had eight write-ups, “nothing major.” Yeah, right. By this time I didn’t want to know anything else about that plane! So we land and taxi all the way down to the end of the airstrip, way away from everything. You know, what with the white phosphorus on board and all. Here comes two vans, each with a driver and one other guy. One guy takes the papers the colonel was carrying and the other guy wants my gun and my four bullets. These were replacements to stay with the plane so we could have some liberty while it was being fixed. The colonel got in one van and I got in the other van. Well, it’s late at night by this time and while the Colonel was probably relaxing in the officer’s club or something, most everything else was closed up. So my driver took me to the civilian bar at the airport terminal. They started serving me rum and cokes in tall, skinny bottles about eight inches tall. I don’t know how many I drank. I vaguely remember the guy taking me back to the plane, but I don’t remember anything else until we landed in Norfolk about 8:30 the next morning. Now, if I’d just waited on that jet to New Jersey and got another flight from there, I’d have been home in Florence, South Carolina long before we ever got to Norfolk, Virginia! They also featured crocheted antimacassars, tatted doilies, lace-edged dresser scarves, and embroidered table runners. My grandmother Mimi took me shopping for those in McCown-Smith one time. I’d never heard the word “antimacassar” before that day — but most folks had one on the back of every armchair and couch. Those were the days of Wildroot Cream Oil hair tonic, and when a fellow leaned back some of his Wildroot would come off, and naturally you needed an antimacassar to keep it off the sofa. Of course, these things would wear out fast with weekly washing, so you’d have to take another trip to Mc-Cown Smith. And of course your knickknacks couldn’t sit on a naked table-top, they needed a lace doily. Likewise your hairbrush and bare wood needed a dresser scarf in between them. McCown-Smith sold them all. Across East Evans Street was Belk’s Department Store. You could go in a big glass swinging door on Evans Street, march in a straight line back to the shoe department and come out on Dargan, then circle back up the sidewalk to re-enter on Evans. It drove the salesladies batty but it seemed like fun at the time. Riding Belk’s elevator was an adventure, if you could convince the attendant you weren’t just horsing around. Running up the staircase was faster anyhow. By the time the attendant closed the door, worked the lift, and on arrival jerked the car up and down several times trying to get the elevator floor level, you could have been up and down the staircase two or three times. I really preferred downstairs Belk’s, anyway. Perfume, bedroom slippers or earbobs, just about any gift item you could want was displayed atop glass cases. Dusting powder or leather wallets, everything had such a neat smell. Belk’s smelled almost as good as the Donut Dinette over on Palmetto Street. 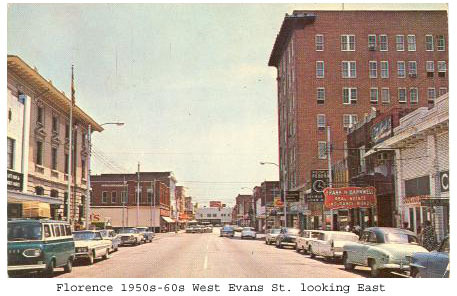 In the middle of the 100 block of West Evans was an amazing store – J. C. Penney. I was fascinated by the cables running through the air from ground-floor countertops to second-floor business offices. Little round containers zipped along those cables carrying money and sales slips, who knows what all. Mechanical ding-ding sounds accompanied the containers up those cables. Today we think nothing of putting our deposits into a vacuum tube at the drive-through and watching it zoom up, over and into the bank building. I guess Penney’s had the idea first, at least here in Florence. On down West Evans, if you crossed the street and turned right on Irby you came to the big Sears Roebuck and Company. Another two-main entrance store (front and back), it offered lots more for a kid to investigate. Clothing took up the front, ladies and girls on the left, men and boys on the right. Cosmetics, jewelry, and shoes occupied the middle. Serious stuff like electric cook stoves and wringer washers were way in the back. There were lots of tools and tires and men shoppers back there. Girls found that department dull and boring; we didn’t do much browsing back there. Hats were a must in the 1950’s and every department store had a millinery section. Big round mirrors were provided with stools to sit on while ladies tried on the latest fashion. Aunt Myrtle, a millinery specialist most of her life, believed in hats! My mother had floppy straw ones with feathers for Sunday go-to-meeting, pill-box types for funerals, and silk-flower caps for weddings. Sears frowned on little girls trying hats on for fun, but switching hats around on the fake heads was amusing when the saleslady was elsewhere. Over in the unmentionables department, long fake legs showed off nylon stockings. No shoes. No torsos either, just legs and hose. There wasn’t any such thing as pantyhose then, just stockings. Ladies wore garters around their thighs to keep them up, or a girdle if they needed extra help holding their tummy in. Fake hands at an adjoining counter wore short “Dress Gloves for Any Occasion,” white or tan for summer, navy blue or black for winter. I wondered if the skin tone went all the way down to the fingers and if the hand had any fingernails, but I never got up the nerve to peel off a glove and see. Watchful sales clerks kept a close eye out when kids went browsing in the department stores (some called it snooping). “Don’t run, don’t touch, and if you break it, you bought it” sort of cramped our style, but browsing was still good entertainment. Even grownups liked to do it in the pre-TV 1950’s downtown Florence.